As promised, here is a really easy, super yummy recipe to spoil Mum with this Mother's Day. 2-3 Slices of spelt bread. To make the berry mixture, use a fork to crush 2/3 of the berries, along with the sugar, into a luscious sauce. Add back the remaining berries and gently stir through, trying to avoid breaking them up. For the french toast, crack the eggs into a shallow bowl and give a quick whisk with a fork. Add the milk and whisk to combine. Submerge your bread in the egg mixture until saturated. Heat a generous amount of butter in a fry pan over a low-medium heat. Fry the bread until it is golden and starting to crisp up, then flip and repeat on the other side. 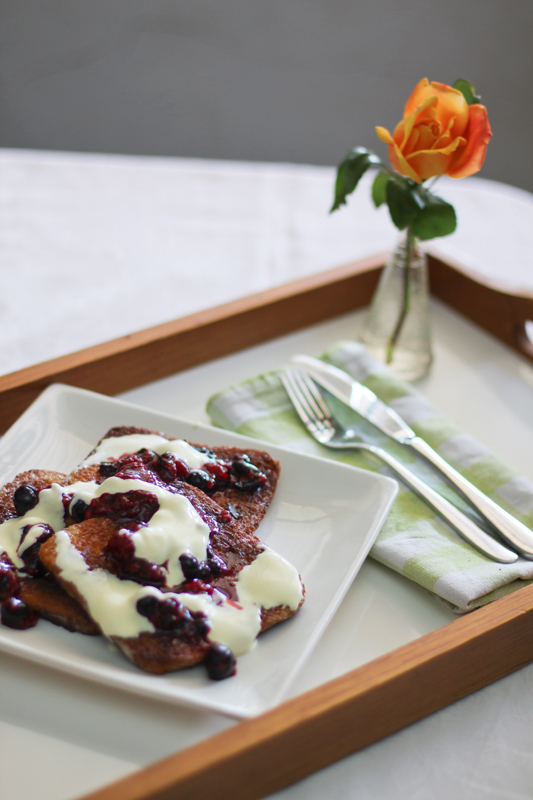 Serve the french toast with your berry mix and a good dollop of thick cream. We've used Cranberry and Goji berry Spelt bread, which makes this extra healthy and tasty, but if you can't get hold of any, try using whole grain, light rye or any type of fruit bread. You can also include some extras for Mum, like a nice cuppa and some fresh flowers.